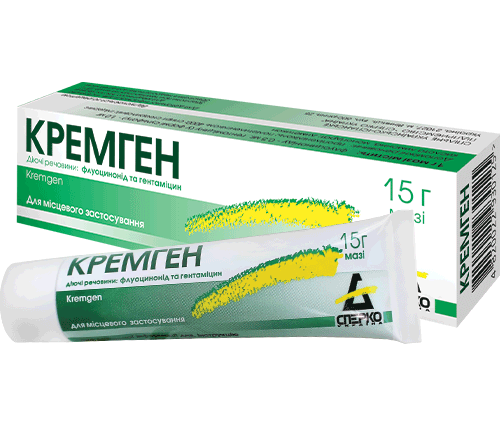 Kremgen - combined action in the treatment of dermatitis / dermatosis: relieves inflammation and eliminates bacterial infections! Kremgen is a combination of highly potency glucocorticosteroid and broad spectrum antibiotic that exhibits pronounced anti-inflammatory and antibacterial action and is used in the treatment of inflammatory, allergic skin diseases and other chronic dermatosis* in adults and children aged over 2 years! 1 g of ointment contains fluocinonide 0,5 mg; gentamicin sulphate 1 mg equivalent to gentamicin and other excipients. o lipophilic base ensures quick penetration of fluocinonide to inflammatory focus in the dermis. Due to two-phase hydrophilic-lipophilic base and deesterification effect of fluocinonide active ingredients are concentrated in the inflammatory tissues, in the dermis and they are practically not absorbed into the general bloodstream. Gentamicin, as a hydrophilic component due to its physical and chemical properties, cannot “pass” through the lipid layer of the dermis and accordingly is not absorbed in the bloodstream. Inflammatory and allergic skin diseases, including diseases complicated by a secondary bacterial infection: different types and localization of eczema, dermatitis (atopic, contact, allergic, seborrheic, radiation, intertriginous, exfoliative, solar), psoriasis, senile pruritus, lichen ruber planus, discoid lupus erythematosus, trophic ulcers (crus ulcers due to varicose veins), first-degree burns and frostbites, insect stings. skin infectious diseases (bacterial, fungal and viral) including cutaneous manifestations of syphilis, cutaneous tuberculosis, pyoderma, chicken pox, herpes, actinomycosis, blastomycosis, sporotrichosis; acne rosacea and acne vulgaris; diaper dermatitis, perioral dermatitis, anogenital itching, skin neoplasms, skin tumors; nevus, atheroma, hemangioma, xanthoma; wounds on sites of applications; numerous psoriasis patches, crus trophic ulcers associated with varicose veins, ulcerative skin lesions; erosive-ulcerative lesions of the gastrointestinal tract, hypersensitivity to active components or to any of the excipients. Kremgen is contraindicated for use in ophthalmological practice. The product should not be administered after preventive vaccination. Adults: The preparation in thin layer is applied to the affected areas of skin, 2-3 times daily. Duration of treatment should be prescribed by the doctor individually and depends on the nature of the disease. Children: The product should be taken carefully under doctor’s supervision, only once daily and should be applied to small areas of skin. Detailed information on the administration of the product in children is provided in the Package leaflet. Short course treatment (no longer than 10 days) is used. It exhibits pronounced anti-inflammatory action having high safety profile. Therapy in adults and children aged over 2 years. For detailed information on the medicinal product Kremgen, please see “Package leaflet” page. Kremgen MA of the MoH of Ukraine No.UA/2099/01/01 dated 07.08.2014. 1the word «itching» shall be understood to mean symptoms of allergic dermatitis or senile pruritus. *shall be understood to mean dermatitis: atopic, contact, allergic, seborrheic, radiation, intertriginous, exfoliative, solar.